March 29, 2019 / Modified mar 29, 2019 3:20 p.m.
Students play soccer on a school playground in rural Guatemala. This story was supported by the Pulitzer Center and is part of a partnership between the Arizona Daily Star and Arizona Public Media. 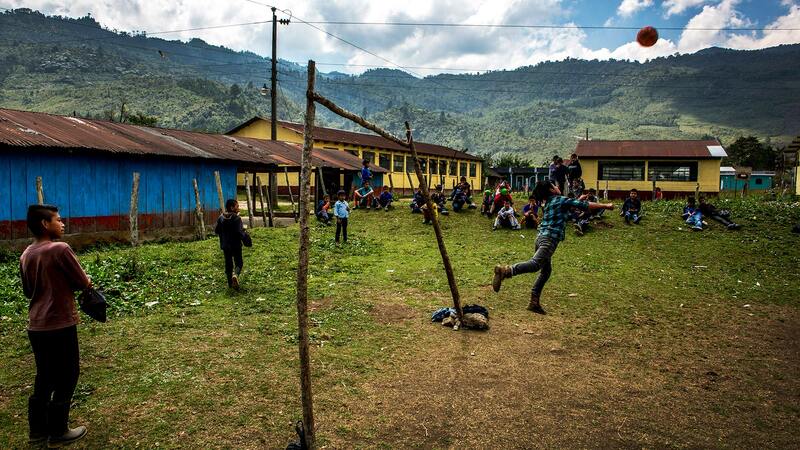 A class of third graders in a rural school of Bulej in the Western Highlands of Guatemala gets ready to go on recess. But one of their classmates is missing. Baldemar García left with his father for the United States. His small desk sits empty. Mateo Domingo Lucas, the school’s principal and a third-grade teacher, says Baldemar left for the United States the previous week, but he just found out the day before from another student. He hadn’t thought much of his absence because it’s common for parents to pull kids out of school to help in the fields. “He didn’t want to go. He didn’t want to go, but his parents took him. Another kid told me yesterday he was also going to go. Fighting that is tough,” Domingo Lucas said, speaking in Spanish. Since October 2016, more than 660,000 parents traveling with their children and unaccompanied minors have turned themselves in to Border Patrol agents along the Southwest border. More than 100,000 others have presented themselves at ports of entry in just the last two years. About 40 percent of them are from Guatemala — comprising the largest single group. VIEW LARGER Teacher Marleny Méndez styles Gilbertina Torres's hair in her classroom before a carnival beauty contest. 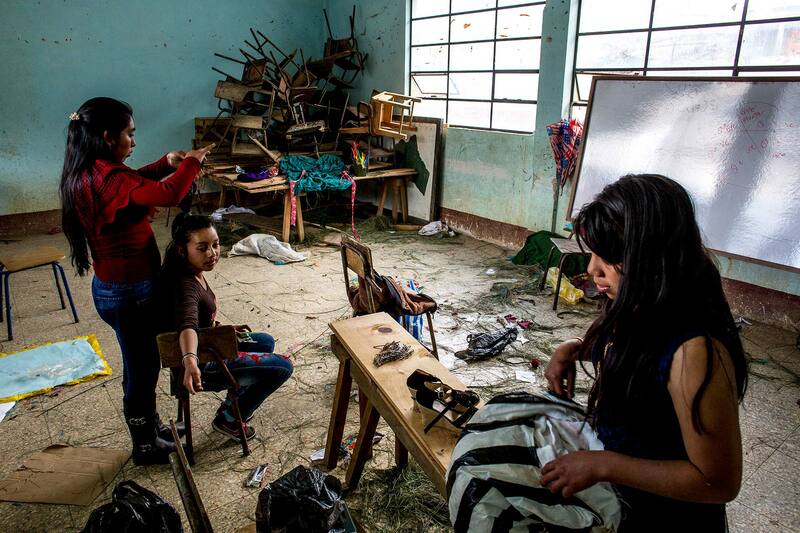 In the back, a pile of desks of students who have abandoned school. VIEW LARGER The desk of Baldemar García sits empty in the back of the classroom of the primary school of Bulej. Baldemar left his community, along with his father, the previous week. While some flee gangs, violent partners or cartels, others leave entrenched poverty for an idea of what life can be like in the U.S. In indigenous communities like Bulej and Yalambojoch, a cycle of debt and tougher immigration enforcement have meant a new migration trend: parents traveling with younger children. Domingo Lucas says in Bulej, they’ve lost about 25 students since January. Ana Mateo is a teacher in the neighboring town of Yalambojoch. A few years ago, they started to see younger boys and girls head north first alone, then with their parents. She says it could be because some people believe there’s a U.S. program that allows minors to enter the country. 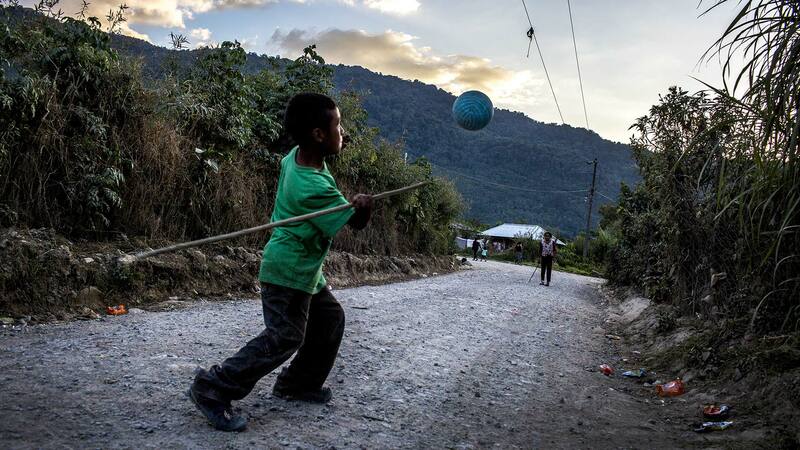 Two children playing baseball on the street in Yalambojoch. Attendance in their middle school program dropped by more than 50 or 60 percent in just a few years, forcing it to close. Some students left for the U.S. For others, the prospect of heading north combined with an increasing sense of hopelessness at the lack of job opportunities locally led them to drop out. “If you did an activity with the kids to figure out what their short-, medium- and long-term goals were, it was almost always, ‘Go to the United States,’” Mateo says. Some have to stop going to school because they need to care for their siblings while the mother works in the fields or fetches wood, tasks the husband used to do. Mateo says that every Sunday at least 10 parents leave with a child or two. Those who leave create a void felt in homes throughout the villages. Candelaria López lives in Yalambojoch and is 15 years old. She has brown eyes and a warm smile and likes to have lots of friends, but hardly has any time for herself. She wakes up before 6 a.m. to make her siblings corn tortillas before school. Then there’s the cleaning, washing clothes and cooking. She stopped going to school after sixth grade because there was no money. Those chores aren’t new. But now that her mother’s husband has left for the U.S. with her sister Olga, it is completely up to them to carry on while they wait for him to send money back. When her husband told her he wanted to leave with her younger daughter Olga, Catarina Domingo — Candelaria’s mom — says she didn’t want to be separated from her children but their financial need was so great she didn’t see a way out. “At that time, with no land, with no money — nothing to build a house with — that’s what we were thinking when my husband left,” Domingo said. 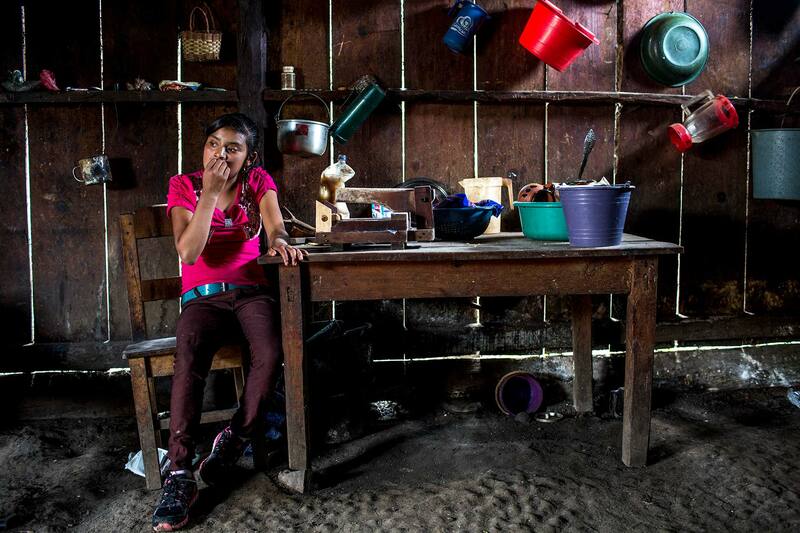 Candelaria, her mother and three other siblings live in two rooms made out of wood with dirt floors. Their neighbors’ homes are built from concrete, using U.S. dollars, and it’s partly that social peer-pressure that pushes more families to make the journey north. When asked what the community needs to make residents stay, Candelaria says she would like to see more farming opportunities. Her mother jokingly chimes in and says that perhaps she would like to find a husband. 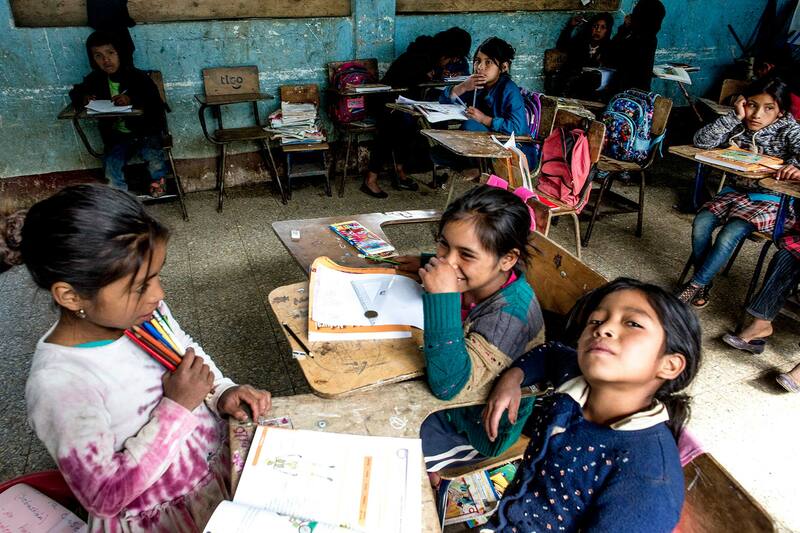 “Even if I would have liked to go to school,” Candelaria says, “it would have been really nice but there’s no money.” It’s almost as if she prefers not to think about that possibility. At the end of the day, Mateo Domingo Lucas, the school principal in Bulej, says teachers are fighting against the dream of having a concrete home, a car, land, or even being able to buy a pair of shoes. Most local teens and even younger children now believe the only way to achieve anything in life is by coming to the U.S.
And that’s a tough dream to fight against. Perla Trevizo is a border and immigration reporter for the Arizona Daily Star. Learn more about her reporting trip in the April 21 print and online editions of the Star. The City of Tucson Offers Hope to Migrants in Need Arizona Governor Signs Repeal of HIV/AIDS Instruction Law Finding Common Ground with "One Small Step"